Atropine Eyedrops May Slow Progression Of Nearsightedness : Shots - Health News Atropine, a medication commonly used to dilate the eyes for exams, can slow nearsightedness in children, a study finds. A dilute solution worked and had fewer side effects like blurry vision. Could Atropine Eyedrops Help Reduce Nearsightedness In Children? Atropine is a drug used to treat multiple eye disorders including nearsightedness and farsightedness. If you peek into classrooms around the world, a bunch of bespectacled kids peek back at you. In some countries such as China, as much as 80 percent of children are nearsighted. As those kids grow up, their eyesight gets worse, requiring stronger and thicker eyeglasses. But a diluted daily dose of an ancient drug might slow that process. The drug is atropine, one of the toxins in deadly nightshade and jimsonweed. In the 19th and early 20th centuries, atropine was known as belladonna, and fancy Parisian ladies used it to dilate their pupils, since big pupils were considered alluring at the time. A few decades later, people started using atropine to treat amblyopia, or lazy eye, since it blurs the stronger eye's vision and forces the weaker eye to work harder. As early as the 1990s, doctors had some evidence that atropine can slow the progression of nearsightedness. In some countries, notably in Asia, a 1 percent solution of atropine eyedrops is commonly prescribed to children with myopia. It's not entirely clear how atropine works. Because people become nearsighted when their eyeballs get too elongated, it's generally thought that atropine must be interfering with that unwanted growth. But as Parisians discovered long ago, the drug can have some inconvenient side effects. Because it dilates pupils and blurs vision, atropine makes it hard to see up close or to stand bright lights. "The children had difficulty reading. They would wear photochromatic glasses to shade against the glare," says Dr. Donald Tan, senior adviser at the Singapore National Eye Center. "We realized, yeah, atropine does work, but we've got to reduce the dose so we can reduce some of these side effects. Otherwise it will never be practical." So Tan and a group of collaborators started testing out different doses of atropine on a group of 400 nearsighted children in Singapore. The participants took the eyedrops every day for two years. 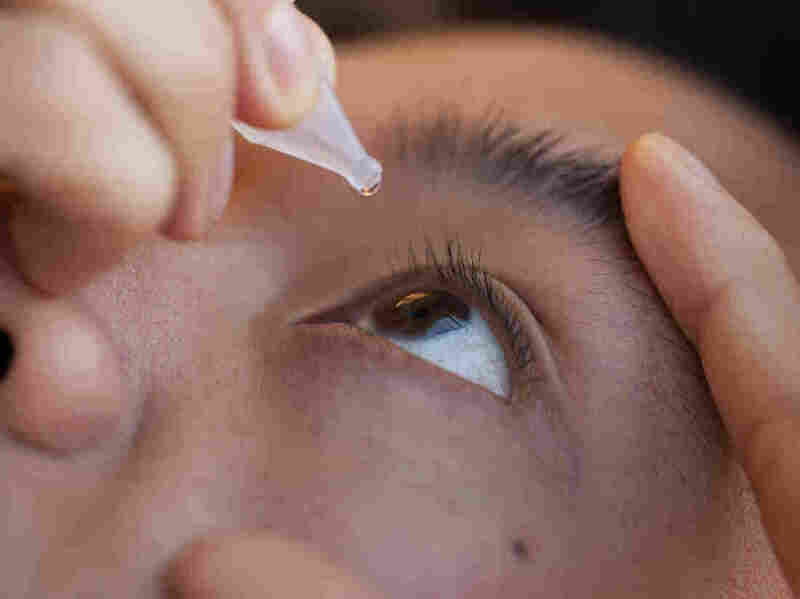 Since some patients' eyes will go into a growth spurt after going off the atropine, the researchers monitored the participants for a year off eyedrops. Patients whose nearsightedness rebounded during that year went back on the low-dose atropine for another year or two. The children getting the lowest dose, eyedrops that were just 0.01 percent atropine, had the least worsening of nearsightedness compared with any other group after a five-year period. "We slowed the progression of myopia by 50 percent [in this group]," Tan says. He and his colleagues have been researching atropine as a treatment for eye problems since the 1990s. Part of the reason this formulation did better, he says, is that these children's eyeballs had virtually no growth spurt after the initial two-year treatment period. And the children on 0.01 percent atropine had almost no uncomfortable side effects from the eyedrops, the researchers reported Monday at the American Academy of Ophthalmology annual meeting in Las Vegas. "That was a surprise. You'd think 0.01 percent would be completely worthless as a concentration, but it turned out to be slightly better." says Dr. David Epley, a pediatric ophthalmologist and a former president of the American Association for Pediatric Ophthalmology and Strabismus, who wasn't involved in the study. "The beauty of it was basically no kids had side effects." That opens atropine back up as a practical treatment for myopia, Epley says. "This gives us a tool to slow down that progression of myopia that we didn't have in a safe way before." Epley has been prescribing 0.01 percent atropine for some children in his own practice. He says he recommends it for children whose eyesight is rapidly getting worse and need new eyeglasses every few months, but not for patients who have only mild vision impairment. If low-dose atropine can be made available to more people around the world, then that's likely to reduce the number of people at risk for developing a retinal detachment or retinal degeneration because of extreme nearsightedness. That's more important now, since the prevalence of nearsightedness has been increasing dramatically over the years, Epley says. About 40 percent of people in the U.S. are nearsighted, up from 25 percent in the 1970s. But making the drug available to a lot of people might not be so easy. Right now, only eyedrops with 1 percent atropine are commercially available in the United States, though 0.01 percent is available in places like Hong Kong, where myopia is especially common. To get the diluted version, families and physicians in other locales need to get a compounding pharmacy to create it, and the Food and Drug Administration has approved only the 1 percent solution so far. A previous version of this story identified Dr. David Epley as a past president of the American Academy of Ophthalmology. He is a former president of the American Association for Pediatric Ophthalmology and Strabismus and a spokesman for the American Academy of Ophthalmology. Also, we previously said Epley prescribes 1 percent atropine. He actually prescribes 0.01 percent.